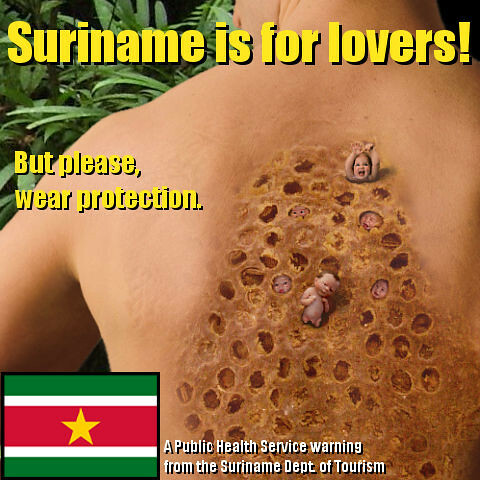 The Surinam toad is one nature's most unusual creatures. It's actually a frog, which spends its entire life cycle in tropical South American rivers and canals. With its flattened body and triangular head, it can easily be mistaken for leafy debris while waiting patiently for a meal to swim by--unsuspecting fish, worms and bugs are sucked into its large mouth with surprising speed. What makes them unique is their reproduction. After the female lays her pea-sized eggs, the male places them on her back and pushes them into her spongy skin. The eggs incubate as mom's new skin slowly develops and covers them, keeping them safe and out of sight. Eventually the eggs hatch inside the skin pockets, and the babies develop through the tadpole stage. 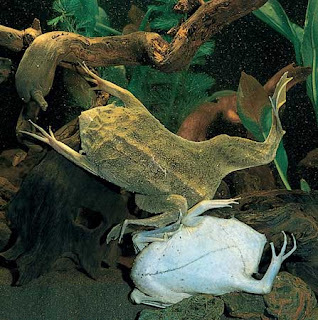 In 70 to 120 days, fully formed froglets pop out of mom's back!